The Danell Ridge collection is so much better for the wear. Its clean, straightforward profile is enriched with solid pine wood treated to a distressed aged pine color finish with light wire-brushed texture. Sliding barn door with wire mesh fronts infuses a farmhouse fresh element that's right on trend. With its generous shelved storage space, this home essential is packed with possibilities. Heavily distressed rustic brown glazed finish. 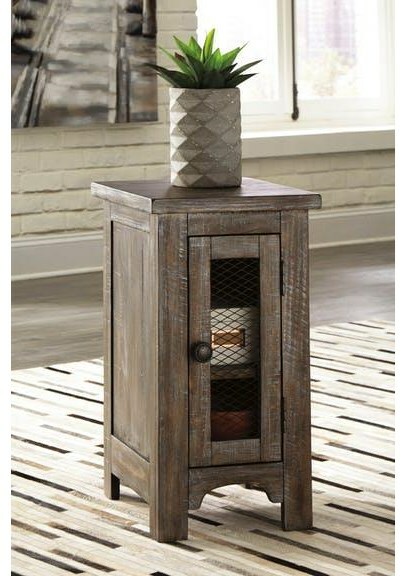 End tables feature door cabinets for extra storage space. The T446 Chairside End Table by Ashley Furniture at Furniture Fair - North Carolina in the Jacksonville, Greenville, Goldsboro, New Bern, Rocky Mount, Wilmington NC area. Product availability may vary. Contact us for the most current availability on this product. The T446 collection is a great option if you are looking for furniture in the Jacksonville, Greenville, Goldsboro, New Bern, Rocky Mount, Wilmington NC area. Browse other items in the T446 collection from Furniture Fair - North Carolina in the Jacksonville, Greenville, Goldsboro, New Bern, Rocky Mount, Wilmington NC area.